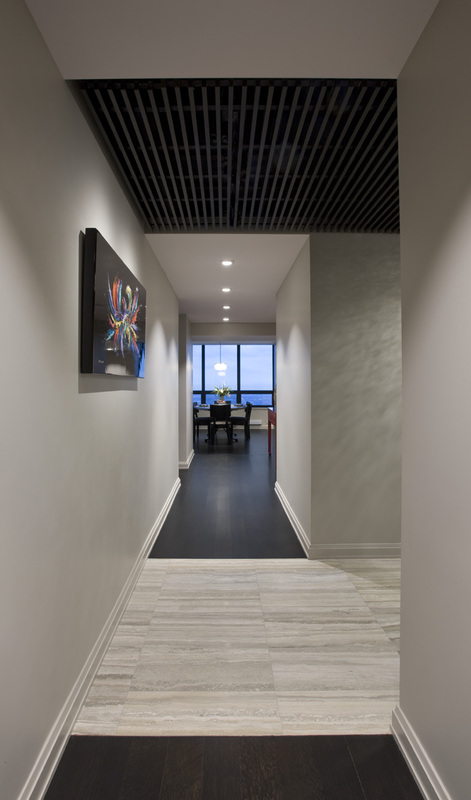 The comprehensive interior renovation of this 60th floor Streeterville apartment was designed to provide a cohesive and calming backdrop to environments and lives in steady flux: from suburban home to highrise apartment, from family of four to empty-nest couple, from sun-drenched to fog-enveloped amongst an ever-evolving city scape. A former 1970’s bachelor pad, the original apartment favored closed off rooms that eclipsed views, multiple floor levels which impeded contemporary entertaining, and outdated finishes. The apartment was stripped down to its structure and mechanical equipment & ductwork relocated to increase perimeter ceiling heights. The floor plan was simplified to eliminate convoluted circulation, and to consolidate kitchen, dining and living spaces to fully exploit spectacular south and west views of the city. A millwork wall with a movable panel allows a new home office to be annexed to the living room. This simple reconfiguration allows the space to scale from the cozy activities of a couple, to hosting the immediate family, to easily entertaining a crowd. Materiality was critical to providing a cohesive and enlivened home. New travertine flooring and countertops coordinate with existing window sills. Espresso-stained quartersawn oak is woven throughout the apartment. As wide-plank flooring, it alternates with travertine tile to subtly delineate spaces; as signature kitchen cabinetry, it is complimented by white cabinetry to balance and organize the space; as built-in wardrobes and sliding wall panels, its linearity emphasizes the horizontal and adds texture. On the ceiling, wood slatted grilles add interest and texture, while concealing lighting and ventilation.